If your business deals with large, expensive 12V batteries (golf cart or forklift batteries, for instance), you know they represent a significant investment. With the XCR-20, your batteries can now last longer and work better than ever before. The Xtreme Recovery Charger works anywhere in the world on all types of 12-Volt lead-acid batteries, including flooded, VRLA and AGM. With its higher output capacity the XCR-20 is used extensively in businesses using larger batteries that need to be recovered and quickly put back into service. The XCR-20 can quickly test, and then begin to recover and charge, batteries you may have thought were dead. You can even test them while they're still installed in equipment, saving time and trouble on reinstallation. Prior to charging, the red TEST LED will be lit while the charger tests the battery and a separate red LED will indicate whether the battery is bad and not recoverable. During the bulk and saturation charging process, the microprocessor controlled circuitry will provide all the charge the battery will accept regardless of the Amp-hour capacity or rated cold cranking Amps. The XCR-20 will charge to the battery's optimum level by constantly monitoring the battery and adjusting the charging current accordingly. LEDs will show the battery's state of charge at 25%, 50%, 75% and 100%. When the charge is complete as indicated by the 100% green LED, the charger will provide a float charge to maintain the battery at 100%. 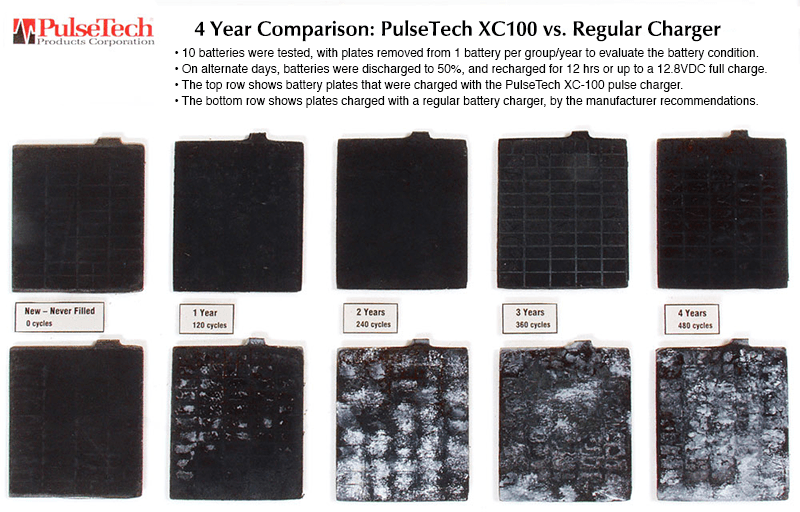 During all three charging stages (bulk, saturation and float), the XCR-20 also reconditions the battery using PulseTech's exclusive high frequency pulse mode. This breaks down sulfate deposits on the battery plates, increasing the battery's ability to accept, store and release energy. The green pulsing lights will flash in sequence during this process.